SFS manufacturers high quality hinges for internal and external doors and windows. Our range includes standard and adjustable hinges, suitable for PVC-U, composite, timber, steel, aluminium and glass doors. Whether for standard or customer-specific applications, we have the right, top quality hinge for every application. Where desired, we can also supply any required assembly accessories. Our hinges are produced in various materials and adapted to market needs. 1. 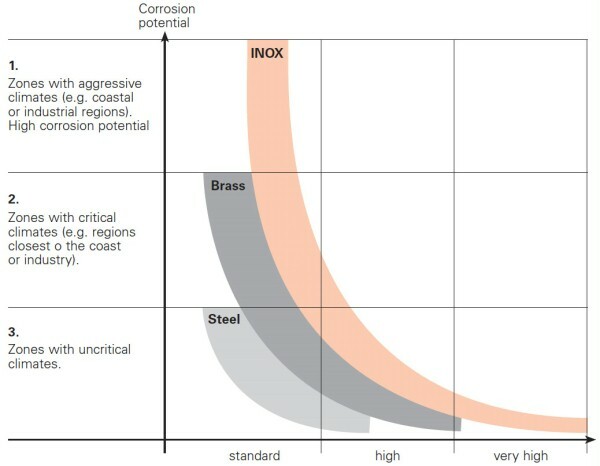 In aggressive climates, where there is a high potential for corrosion, we recommend the use of INOX hinges. 2. In critical climates, such as coastal regions, we recommend the use of brass hinges, but for a more superior performance level and specification: stainless steel. 3. In neutral climate zones, we recommend the use of stainless steel hinges, although for a higher specification, brass and for the highest specification level - INOX hinges. 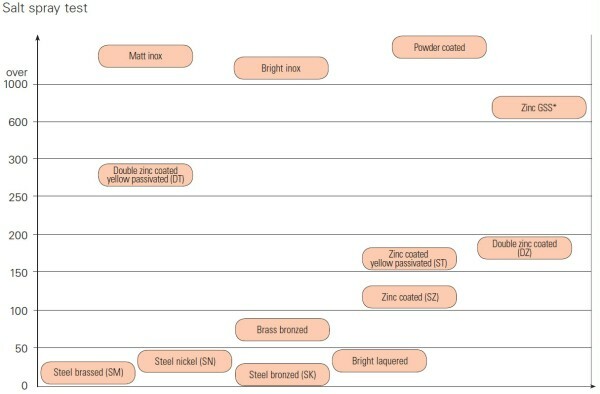 In addition to the listed standard surface coatings, other surface coatings are available on request. 1. Load the hinged test element to the mass according to the class of hinge under test. 2. 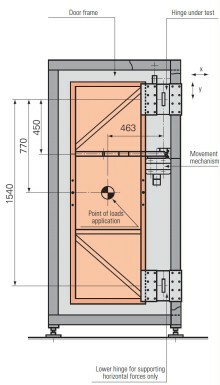 Measure and record the initial horizontal and vertical distances between the hinge elements and the defined reference surfaces. 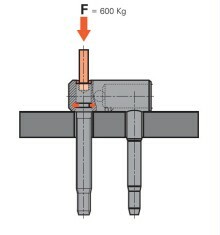 Apply force of 6000 N to the threaded bolt in the axial direction, as illustrated. The threaded bolt bearing must not sustain any measurable changes. The threaded bolt can still be rotated easily after the test. The special 3-step threaded bolt (patent protected) anchors the hinge securely in the profile and ensures optimum load-bearing capacity. The three functional steps of the threaded bolt, the dedicated step drill and SFS's fitting tools permit fast and problem-free fitting of the hinge. Pilot hole produced with the matching step drill. Step 1 of the threaded bolt is inserted in the pilot hole. Since the entire length of the bolt does not have to be screwed in, fitting time is reduced. The reduced pilot hole diameter centres the threaded bolt automatically. There is no tilting or skewed insertion. Screwing the threaded bolt in to step 2. The well-formed buttress thread forms a perfect fit in the wood and produces optimum anchoring values. Since the borehole matches the threaded bolt, the latter is anchored securely in the profile over its entire length. Step 3 compresses the profile. 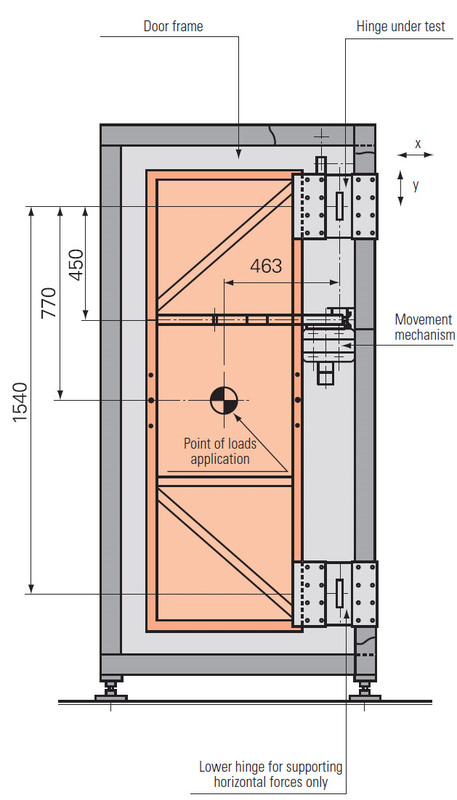 The close-fitting cylindrical section ensures maximum load-bearing capacity of the hinge. If the diameter of the threaded bolt's rear section is the same as the core diameter of the thread, this has an adverse effect on the load-bearing capacity of the hinge. There is no form-fit anchoring just where the largest load is applied. SFS's hinges can also be readjusted at any time. This is only possible in one direction with tapered threaded bolts. 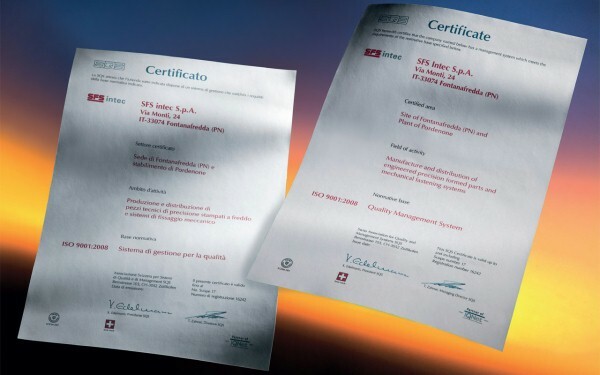 SFS maintains a global Business Management System encompassing quality, environmental and health and safety management: ISO 9001/2000 and TS 16949:2000. SFS's company culture of quality not only ensures the manufacture of consistently high quality products, but it impregnates the whole supply chain. We are committed to providing our customers with the best product, best service and best customer support possible.